The department of Educational Technology collaborates with faculty, staff and students in order to explore ways that educational technology can support the University’s mission, enhance program outcomes, and foster student engagement. We endeavor to offer a wide range of tools and services to meet the needs of HCT faculty. We offer services in digital content development, teaching & learning application development and deployment, instructional design, professional development in Educational Technology as well as advice on technology integration. The Ed Tech team based at Central Services and across all HCT campuses are committed to supporting University-affiliated students, faculty and staff with their educational technology needs by offering a range of supported technologies that supplement the institution’s enterprise learning management system (Blackboard Learn). Some of these are listed below. Teachers & Ed Tech Staff ONLY: As you start the semester, this is the application through which you request your current teaching section in Blackboard. This application enables you to view all the shared courses within the HCT System. This tool is an online virtual seminar, meeting, and classroom lecture tool that allows real-time virtual collaboration and lecturing. How do I use BB Collaborate? To learn how to use the tool, please visit this page. LockDown Browser is a custom browser that locks down the testing environment within Blackboard. Students are unable to print, copy, go to another URL, or access other applications with an assessment in progress until they submit it for grading. To learn how to use the tool, please visit this quick guide offered by Respondus. This is a plagiarism prevention tool that is inbuilt within Blackboard for students and instructor. It can be accessed through Blackboard Learn. For more information, please visit this guide. How can I access SafeAssign? On your course page on Blackboard Learn, you can find SafeAssign under the Course Tools menu on the left sidebar. For more information on how to integrate it in your course, you can watch this tutorial. Setting up a Grammarly@edu account is extremely easy: Teachers need to just instruct their users to use the unique access code (for HCT users) for registering a new account at www.grammarly.com/edu/students, and they are ready to go. To request this unique code, teachers should contact the Ed Tech staff of their college campus. How can I use Grammarly? To learn more about Grammarly click here to access the Grammarly Manual. 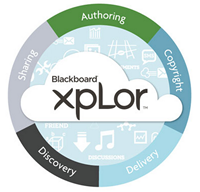 Blackboard xpLor is a cloud-based, global learning object repository for authoring, copyright, sharing, and discovery of rich educational materials and open educational resources. It is built on open standards and is designed to support rich learning objects such as assignments, assessments, and discussions, as well as traditional content types. Learning objects can be shared beyond the confines of a single LMS environment and shared objects will work in any supported system without alteration. Existing content can be moved from the LMS platform to xpLor, making it accessible in multiple courses on multiple platforms.